Jan Marshall, along with her husband Andy, owns Puckett’s Grocery & Restaurant in downtown Chattanooga. Puckett&apos;s is focused on providing its patrons with great food and Southern hospitality. It has built a name on hosting live, local musical acts and serving Southern staples. Below, Jan shares a little bit of the Marshall family’s history with Chattanooga and how the restaurant is keeping things local. Be sure to check out Puckett&apos;s live music schedule with shows every Friday and Saturday night. Can you tell us a little bit about your connection to Chattanooga? When our family was considering opening a new Puckett’s Grocery & Restaurant location, Andy and I were immediately drawn to one of our favorite places: Chattanooga. Our connection to the Scenic City goes back to days spent taking our three (now grown) children, Claire, Emily and Cliff, on countless trips here for soccer games, state championships and to explore the Tennessee Aquarium. How did you choose the location for the downtown Puckett&apos;s? Four or five years ago, we began an initial hunt to find the perfect spot for a Puckett’s in Chattanooga. 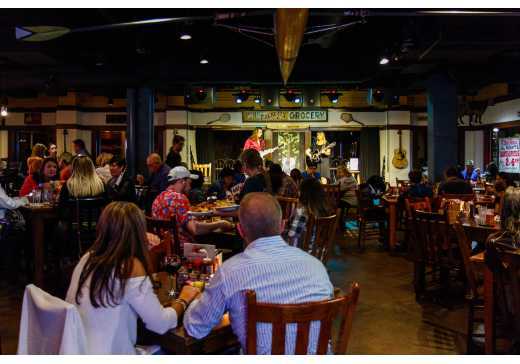 River City Company contacted Andy about a space opening up near the Tennessee Aquarium, and our team spent several months renovating the space and transforming it into a true Puckett’s home. Your restaurant displays a lot of local antiques. Can you tell us a little bit about finding these pieces? As a family-owned and operated business, we like to keep things as local as possible. I enjoyed shopping all over the Chattanooga area to decorate the restaurant. There are several local antique shops and businesses that we used to decorate the restaurant, and many are located in the downtown area. Some of my favorite finds include The Knitting Mill, Gateway Antiques, all the shops on the Southside, as well as those in South Pittsburg. Can you tell us about the photography displayed in the restaurant? 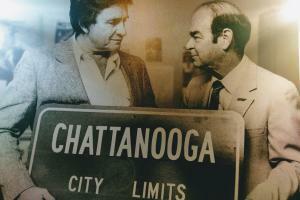 Chattanooga has a treasure with Tracy Knauss’ photographs. All of the family photographs in the front entrance of Puckett’s are of one family around Lookout Mountain. Knauss did an amazing job restoring all those pictures to digital quality. The Chattanooga Library Archives is also a great find, and it’s where I obtained the famous Johnny Cash picture with the Chattanooga sign. Since the outdoors and the Tennessee River are such major draws to us all in the Scenic City, I loved getting the one-man racing scull boat with oars from the Lookout Rowing Club that now graces the ceiling. We also had to have memorabilia representing &apos;Nooga staples like Moon Pie, Coca Cola and Little Debbie, plus a Volkswagen hood purchased from an art gallery on the Southside. You have five different Puckett&apos;s restaurants located throughout Tennessee. Who oversees the Chattanooga restaurant? We are so proud to have Max Stephenson, the General Manager here at Puckett’s Chattanooga. Max has been an important member of our team for ten years now. A native of the Monteagle Mountain and Sewanee area, Max chose to take on the role of GM in Chattanooga and return to a place he holds dearly in his heart. Our son, Cliff, attended school at UTC, and was a manager at Puckett’s Chattanooga during its first year. What do you like about Chattanooga? One of of our favorite things about the city is its walkability. When we come visit, Andy and I take a daily trek around the river, up the Walnut Street Bridge, around the Bluff View Arts District and end up back down at Puckett’s. Puckett&apos;s features local musicians every Friday and Saturday night. Can you comment on that? We are really impressed with the thriving music scene in Chattanooga. Music is an important part of many cities, and Chattanooga is no exception. There are many local musicians who perform on the Puckett’s stage. This city is full of talent, and we make it a top priority to highlight that. What else would you like to share with us? Our family is so pleased that we chose Chattanooga as a home for Puckett’s Grocery & Restaurant. We are charmed by this vibrant, friendly city, and we are always on the hunt for opportunities to become involved with the community. We’re proud to support organizations and events like Northside Neighborhood House, the Little Debbie IRONMAN, The River Gorge, Kidney Foundation of the Greater Chattanooga Area, Riverbend Music Festival, among others. Thank you to the people of Chattanooga for welcoming us into this great city, and we look forward to serving you at Puckett’s! Free! Discover local attractions and find out why Chattanooga is the Best Town Ever!